We spent an enjoyable Thanksgiving in Lynden with the Eides. Bjorn and Jenny weren't there as they went down to Oregon, though we were able to connect on the road as they made their way down and we made our way up with Markus. Kay's family from Tonasket came over the Cascades, so it was an Eide/Pridmore event. 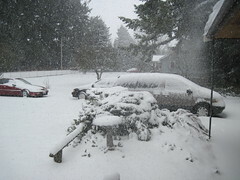 We awoke Thanksgiving to a thick blanket of snow which kept thickening as the day went on. I could not recall ever having a white Thanksgiving, though Esther vouches for such in her imaginary childhood:) We visited my Mom a couple of times which is always an emotional challenge as she responds less and less each time. We did not participate in the Black Friday frenzy, though we did do something uncharacteristic in that we watched seven hours of football in one day. Ending our weekend back in Southworth, we had the unexpected surprise of connecting and having dinner with Doug and Merri Monkemeier who pastored at Harper when we first came to Southworth. It was good catching up on one another's lives and families.